As I was back on my own again, it was time to head South to more populated areas mainly Cherno and Electro about 6-7km away. Before I headed off, I had a quick search of the school I was in, I found a pristine M4 hiding in the corner of one room. With my SKS shouldered I picked the M4 up, yea that’s how I role, 2 guns! Well 3 if you include the pistol in my pack. Plus I had 180 rounds on me, so thought I may as well put them to some use. I trekked across fields and past farm buildings until I reached Green Mountain North East of Zelenogorsk, within the compound is a jail building, I entered the compound scanned the area, and took out the roaming zombies. Once clear I entered the jail house building, it was fresh, but most of the supplies I didn’t really need. I wanted to get a view of my surroundings so decided to climb the radio tower. I quickly found out that you can’t actually go that high up in it. I made my way back down, and as I re-emerged outside, I noticed the doors to the jail house were closed. Someone had to be nearby, possibly still inside. I raised my gun, and cautiously approached the building. I opened the front doors, took a peek inside. No one there. I crept in slowly, trying to make as little noise as possible. As I rounded the corner in the hall I saw a flash of legs run across the landing. I immediately aimed my gun at the stairs. “Friendly?” I called out…. nothing…. “Show yourself, and put your hands up.” someone walked in to view at the top of the stairs, hands held high. They had no gun on their back, only a baseball bat. Gun still aimed at him I asked “Are you alone?” No response “Mic?” Still nothing. Obviously not in the mood for talking. Do I kill him? I didn’t really want to shoot someone for no reason, and it didn’t look like they had anything of interest so I lowered my gun and backed out of the building. I ran from the compound, keeping an eye out behind me and continued my journey South. As I broke clear of the Green Mountain, I received a message from a friend. He was in Electro, and wanted to meet up. 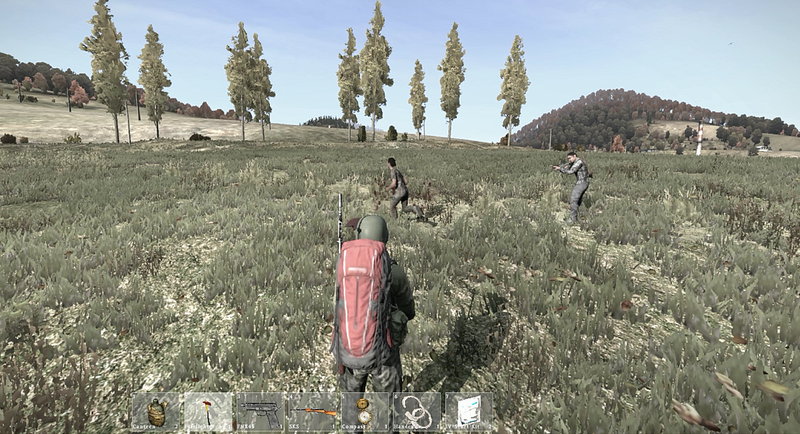 We decided to both head to Cherno. I skimmed the edges of the Balota airfield and the Chapaevsk apartments on my way, all was quiet. 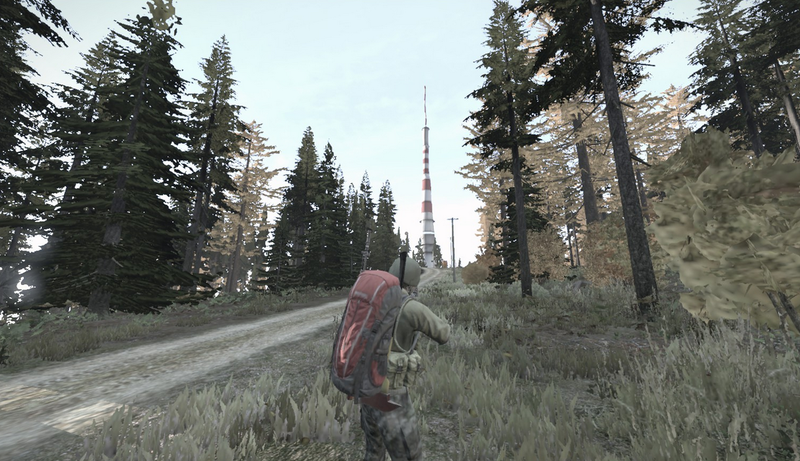 We eventually met up just East of Cherno by a construction site. 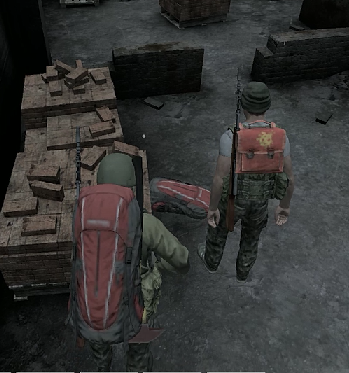 As my friend had freshly spawned he was still looking for some gear, and construction sites are usually a good bet for backpacks. After a quick scan one was found. Then just as we were heading back downstairs we saw someone running around below us. We quickly pursed them with the idea of holding them up. As Sean ran downstairs I heard him over my mic “Oh no” “I’ve broken my legs.” Ok, this is getting ridiculous now. 3 times he has broken his legs! This time is was a glitch through the floor which had caused it. I was still searching for the other guy running around, he rounded a corner in front of me wielding his axe, I backed away and started to raise my gun. But before I could say anything, or take a shot I glitched through a wall behind me, and completely lost him. I ran as quick as I could to get back to where he was, but he was gone. Never to be seen again. Whilst all this was happening, Sean had been attacked by a zombie and had been killed… After a quick respawn he was in Electro again. I made my way there to meet him. We met up in an apartment building, this time I handed over my M4 and rounds, as I still had my SKS, and had grown quite attached to it. We started to make our way to the North of Electro, when Sean spotted someone running across and open field, we sprung in to action hot on the heels of said person. They were bleeding. We’d managed to catch them up only to find out that they were already dead, and they were just glitching out. From here we headed towards the power plant. As we were climbing the tower, Sean called out to me “Quick, come handcuff this guy.” Someone was sat on the top floor not doing anything. Just as I reached where they were, he logged out. We just missed him. This episode had quite a few near miss encounters, things were starting to ramp up, and I’ve decided that I will make sure I only play on servers that are as full as I can find, to maximise the possibility of meeting people. Up until now, I’ve just selected random ones, whether they have been full or not. So stay tuned for the next one, as it should start to get a lot more interesting, or I will just die straight away…. Hey, I might even include some video, as I’ve been messing around with that.